A while back we tried baked eggs and found a versatile dish that was a keeper. The only drawback with our original version is that you have to turn on the oven, even if you just baking two eggs. Sort of seems like a waste, doesn’t it? 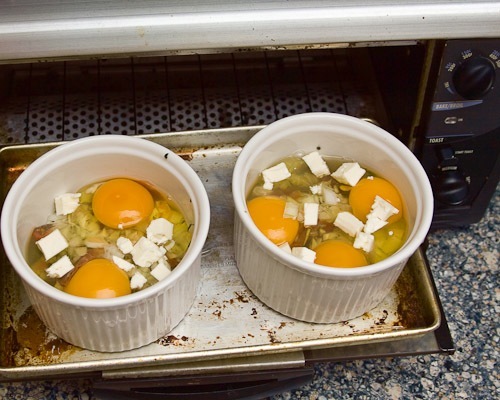 Luckily we have a toaster oven and the ramekins we use for baking eggs fit perfect. I gave it a try and it worked out perfectly. 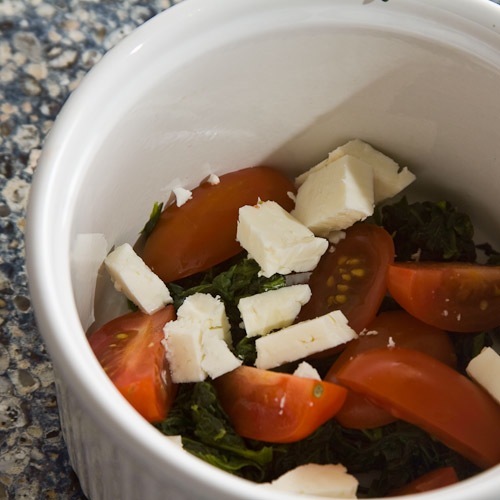 Each ramekin had two eggs, some tomatoes, spinach, a little milk and bit of cheese. I baked them for 15 minutes at 375 degrees, rotating once. Using a toaster oven makes an easy dish even more convenient! Give it a try and report back how it works for you. Hi, my mini oven had no degree indication just purely with timing knob only. Is it still possible to do it? thanks! I have a question for all of you…. how are you cleaning those baked on ramekins? I am having a hard time getting them clean! I grease the ramekin with butter prior to putting anything into it. That seems to make cleanup a lot easier. If I forget, the ramekin gets to soak in hot water with some liquid dish soap for a bit then scrubbed with a dish brush or a netted sponge. The ones I use are about 4 or 5 inches across and about 2 or 3 inches deep. You want enough space for 2 eggs and some fixens! You basically use mashed potatoes to cover the bottom sides of the muffin tin leaving a space for an egg in the middle. Let me tell you–it’s DELISH! I just have to say, your bog is awesome :) I’ve been wanting to start a cooking blog because I love cooking. Keep it going!! Good luck, I’ll be checking your posts regularly. Ahhhhh, I just had baked eggs. I used a 3 hole footed egg poacher (designed to fit in a pot of boiling water) and put it in the Black & Decker Infrawave Toaster Oven. I used your settings 375 degrees for 15 minutes which my toaster oven converted to 12 minutes. They were still a bit too cooked since I like them runny but now I know once I get the exact time right, it will be reproducible and quick and very tasty. Thanks! I tried this for dinner tonight. They came out beautifully, even though my second-hand, cheepie toaster oven didn’t manage heating well with the stoneware ramekins. I turned up the heat to 400 degrees, then broiled for another 5 minutes. Tried 2 different layerings. First: I put Canadian bacon on bottom, thinly sliced tomato, the egg, then finished with grated parmesan and s&p. Second: The bacon, then egg, with tomato on top, sprinkled oregano and a little salt over it, then grated parmesan over it. They were lovely over English muffins. Rather than using the whole oven, it was an easy way to cook with less energy use and heat build up in the house. Great to hear it worked out! The toaster oven seems to be a great way to bake if it is only for a couple of people. I love asparagus roasted in the toaster oven. 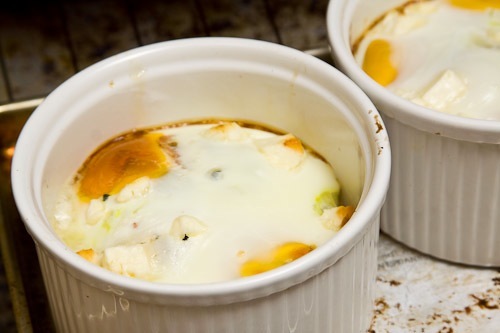 I’ve been wanted to try baked eggs forever, but my cute little ramekins are in the States. :-( But I bought a great little French “cocotte” cookbook, and the first one I’m going to try is asparagus and coppa! I have heard about people who have managed to use muffin tins for baked eggs. Could be worth a try! That sounds like a great combo. What a great idea! I used one egg, some tomato, basil, and feta. Delicious breakfast with almost no effort. Loved it! I have been making mine with one or two eggs, little bit of milk, spoonful of frozen hash browns, chopped mushroom, and a bit of diced tomato. Cooked til done and served on a warm, buttered bagel! Thanks for the idea!